The fourth EU anti-money laundering directive (AMLD) will require EU member states to keep central registers of information on the ultimate “beneficial” owners of corporate and other legal entities, as well as trusts. A “beneficial” owner is defined as a person who actually owns or controls a company and its activities and ultimately authorizes transactions, whether such ownership is exercised directly or by a proxy. These central registers were not envisaged in the European Commission’s initial proposal, but were included by MEPs in negotiations. 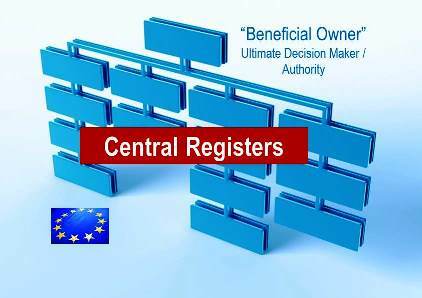 It will be up to the Member States to decide if these central registers are in the form of a central database, business register, or another central register, leaving the possibility for public / private partnerships on the register maintenance. However, the data processed in these registers will be used in money laundering prevention and activities considered in the directive, as recital 31 makes it clear that further processing of personal data for commercial purposes is prohibited. The permissive use of this data is limited to authorities and to banks as part of their compliance due diligence processes. Other access will only be permitted if an interested party can demonstrate a ‘legitimate interest’. Why do we need new registers? What is missing in current registration requirements of companies and legal entities? Why limit this initiative to anti-money laundering prevention measures? Loss prevention in the lending and trade credit sphere is equally important for a national economy. In view of this why restrict access to the data in question? There is some consolation for the business information industry that they may be permitted to participate in developing and managing these registers. However stacking new registers on top of existing ones, does not make sense. What do industry members (and the tax payers) have to say?